With less than a month until Star Wars: The Force Awakens finally brings the beloved franchise back to the silver screen, it’s safe to say that Star Wars fever has a firm Force chokehold on the entire world. From gigantic house decorations to fan edits of the original films, people have done anything and everything to express their love for the iconic sci-fi saga. Now it seems even Internet giant Google is getting in on the action. IFL Science! has revealed that Google has hidden some pretty awesome Easter eggs within some of the basic programs of their site. One such Easter egg simply requires users to type the iconic words "A long time ago in a galaxy far, far away" into the Google search bar. Doing this will cause the Google search page to turn into the legendary yellow and black opening exposition crawl that precedes the events of every Star Wars movie. It has also been revealed that Google has created Google.com/StarWars. 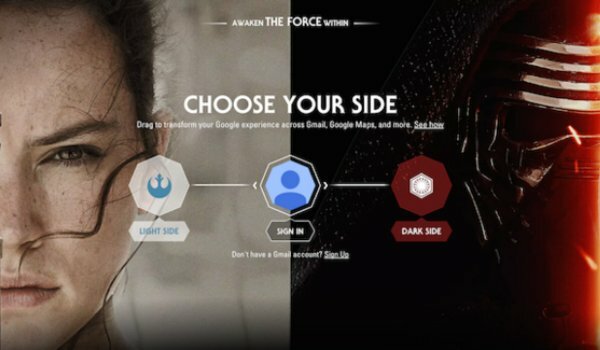 This page allows users to choose either the light side or the dark side, and this decision will alter their Google experience. Everyday apps such as Gmail, Google Maps, and others will reflect the moral decision that users made – giving off a Jedi or Sith theme. Google Maps Street View will also put users into the cockpit of an X-Wing if they opt to choose the morally righteous light side of the force. Check out the home page for Google.com/StarWars below. It seems worth noting that while the dark side is obviously represented by the villainous Kylo Ren (Adam Driver), the site uses Rey (Daisey Ridley) to represent the light, possibly indicating that she will be the pure moral compass among the film’s protagonists. Basically, if you’re trying to make sure that every single thing in your digital life is themed after Star Wars, then Google seemingly has you covered. We’re just glad that nobody at Google decided to add a function that would take an assessment of a user’s midichlorian count – because just no. If you’re anything like the rest of us, then the wait for Star Wars: The Force Awakens is tearing you apart. To get your fix on the galaxy far, far away through the next month, definitely check out some of these Google Star Wars Easter eggs. Star Wars: The Force Awakens will blast into theaters on December 18 – but we would venture to guess that you already knew that.